The exchange interaction between different magnetic moments is the dominating force determining spin ordering in magnetic materials. In particular the interplay of itinerant d-electron and localized f-electron magnetic moments in 4f metals and their alloys opens up new routes to control their magnetic behavior on ultrafast timescales. Here we use femtosecond time-resolved resonant magnetic x-ray diffraction at the Ho L3 absorption edge carried out at the X-rey free electron laser LCLS at SLAC (USA), to investigate the demagnetization dynamics in antiferromagnetically ordered metallic Ho after femtosecond optical excitation. 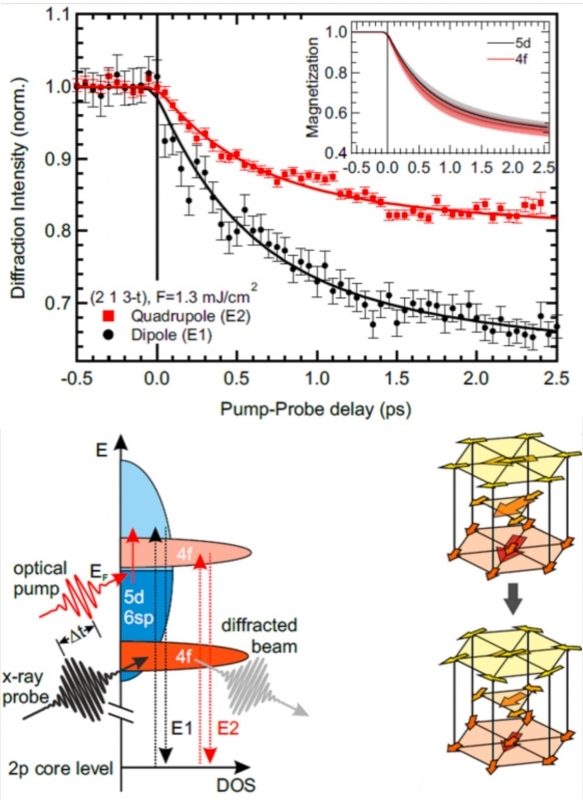 By tuning the x-ray energy to the electric dipole (E1) or quadrupole (E2) transition we investigated selectively and independently the spin dynamics of the itinerant 5d and localized 4f electronic subsystems. The simultaneous demagnetization of both subsystems demonstrates strong intra-atomic 4f-5d exchange coupling. The demagnetization time scales which are very similar to ferromagnetic 4f systems, suggest that the loss of magnetic order occurs via a similar spin-flip process in both cases. In addition, an ultrafast lattice contraction due to the release of magnetostriction leads to a transient shift of the magnetic satellite peak. Figure 1. Bottom left: Schematic view of electric dipole and quadrupole transitions probing the band like 5d and localized 4f magnetic subsystems of elemental Holmium, respectively. Top. Time traces of the magnetic 4f and 5d response, exhibiting equal demagnetization time scales. Bottom right: magnetic structure of elemental Ho.